Pissed fool at Wistful (part two)..
Saturday started with a slightly thick head, which was soon put to rights by a hearty breakfast from Moo n’ Brews (whose awesome home made burgers I neglected to mention in Friday’s update). Coupled with a nice slug of breakfast mead from The MeadEvil bar and the world was looking a much better place, certainly was for Paige who appeared to have taken up residence at the bar for much of the day! Meanwhile in the barn Ovacast got the day off to a very lively start – mainly blasting out very accomplished rock covers (clearly my note-taking wasn’t up to much, I only captured Wanted Dead or Alive – but it was very tight. Lisa H was their main spokesperson over the weekend so I discovered they’d actually been performing together for years, they were excellent – I think the energy of their set would’ve benefited from being on a little later in the day but still most enjoyable! To follow was the inimitable Brian Stone, it was pretty warm in the barn – and I don’t doubt he was up ’til the wee small hours around a campfire somewhere on the site. It didn’t detract from the performance though – kicking off with Life Begins @ 50 and then into Barrow Downs. His rendering of Ward The Pirate was delivered complete with ‘the dance moves’ from Karen and Ella initially, before spreading further into the crowd. Did She Know? 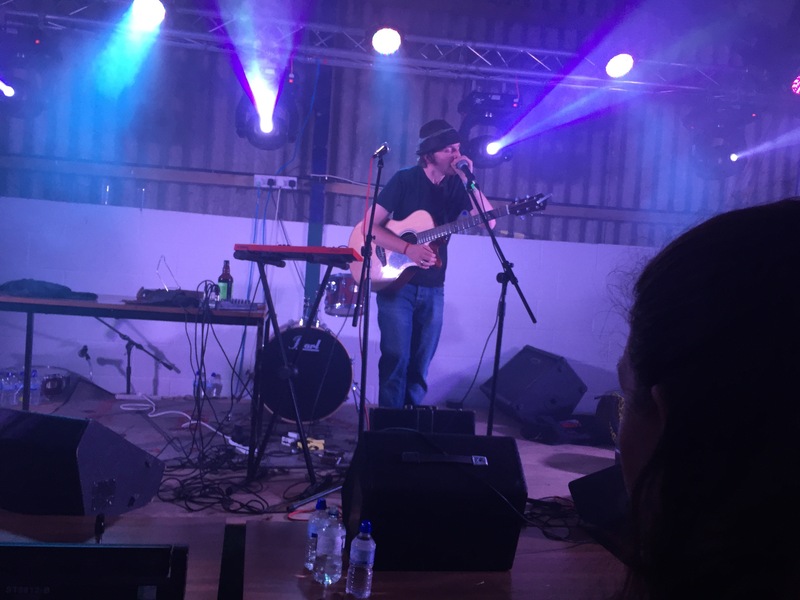 was clearly a very moving song for him to perform – you can check out the backstory to that here to find out why, I think it’s an incredibly brave thing to lay such intimate things open to the world in song. 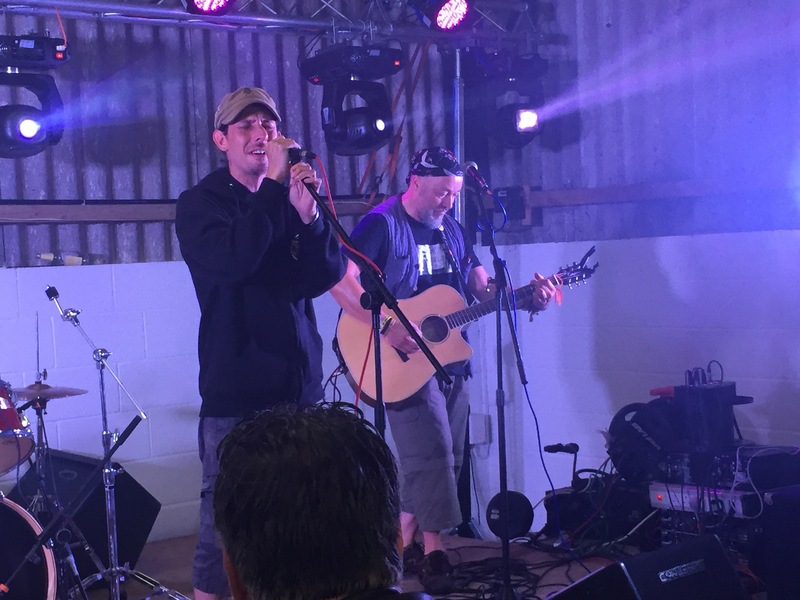 He followed that up by inviting 3 Eyed Fox‘s Jonny Wallis on stage to sing Julie, before revealing the exciting news that they’ll be collaborating for live dates later this year – with time tick-tocking away he finished up with Why Is All The Rum Gone? with the hip flask making its way around the crowd. Lovely set. Next up Barnie Rubblz hit the stage – what was striking was how young they were (they are 16, 14 and 12). Three brothers, they revealed, alternating vocals between drummer Seth and guitarist Jorge, and treated us to a rock-tastic set of covers. An eclectic and well considered mix of songs like The Boys Are Back In Town, Teenage Kicks, Cigarettes And Alcohol and Don’t Look Back Into The Sun certainly lured me back from another mead visit to see them finish up with a rousing My Generation. Ones to watch for the future, these lads! 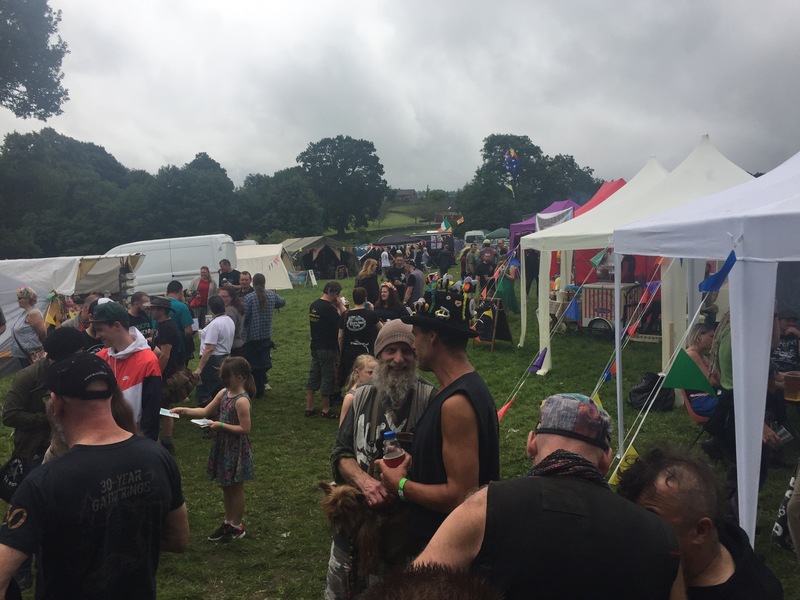 The festival was properly livening up – it’s worth taking a moment to appreciate the setting, the scenic Derbyshire hills, the fine array of people smiling and dancing. Back at the MeadEvil bar Funke and the Two Tone Baby had arrived and been handed a very appropriate beverage, his first impression of Blue Monkey Brewery’s Bonobo was dubiousness, but by the second or third slurp he was getting quite into it! 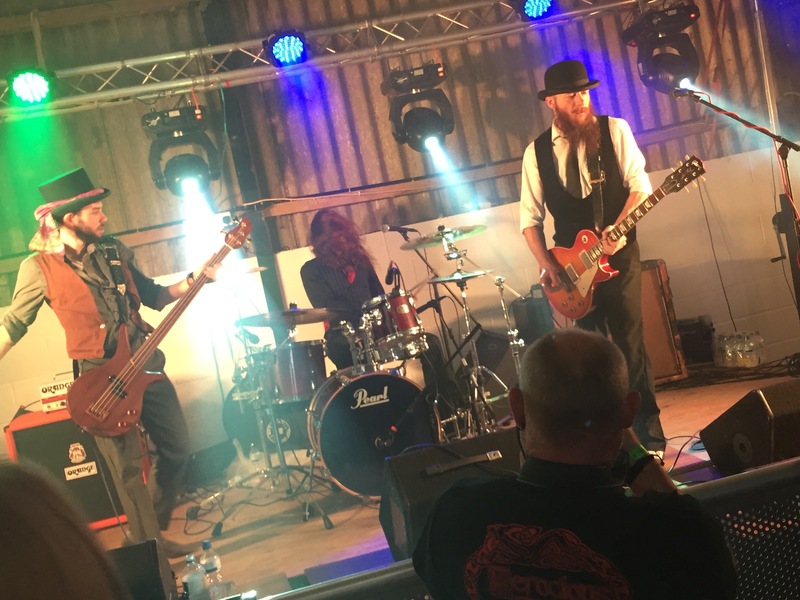 Darren Eastell & The Freaky Fingers hit the stage, a funky rock and roll sound, we’ve already planned to go and see them up in Doncaster in September, I’m quite keen to get to know their songs better. Bruce Jenner was one, and another called Morning After – but t’was most engaging musicianship and Darren makes for a fun front man, I’m looking forward to the opportunity to get to know their music a little better. Karl Phillips and the NGF Rejects were next, from the remnants of New Groove Formation we were treated to a very comparable sound. 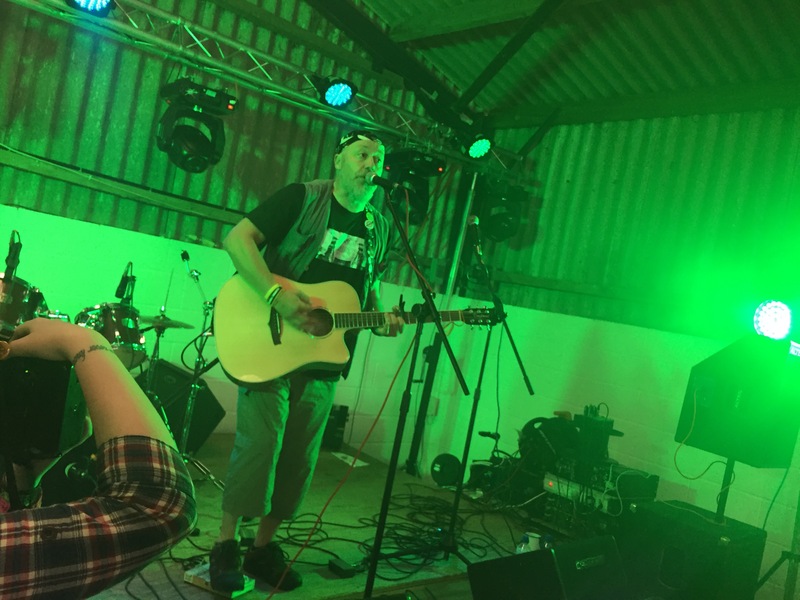 Bouncy ska, funk and reggae infused with a smattering of hip hop – Karl had added in some singing to his repertoire in the absence of Quinny. It worked really well, highlights included Let Go and a raucous finish of Disco Ship which really had the crowd bouncing considering it was still relatively early in the day! The Bar-Steward Sons of Val Doonican arrived (well, two of them) with awesome ‘never mind the tank tops’ t-shirts I neglected to order (I do have too many t-shirts) before hitting the stage in duo guise, Alan sadly unavailable. Not that it spoiled a splendid show – lots of familiar favourites like She’s From Dodsworth, Bag for Life, Walking in Man Piss, Lady in Greggs – but also some new ones on me, one based on Addicted to Love that I couldn’t catch the words for and another about Snoring In Your Sleep. 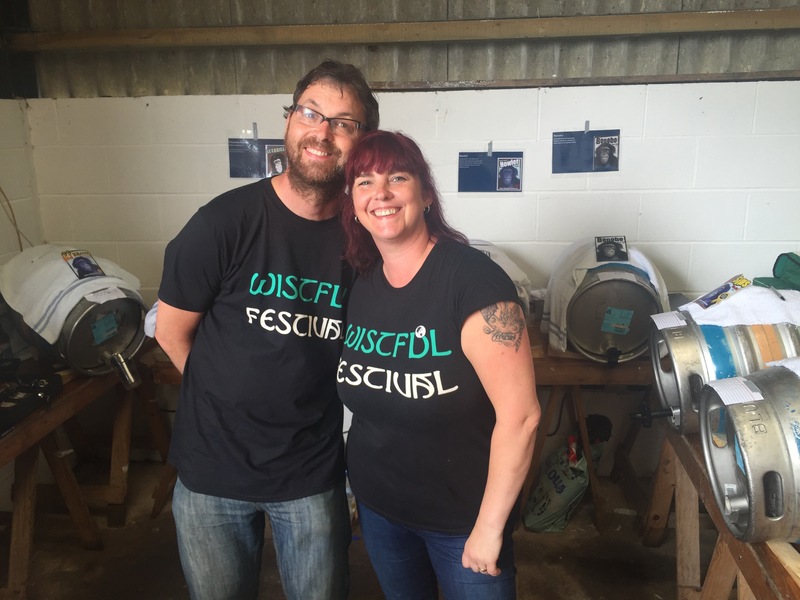 They finished up with Kanye West is a Cockwomble – definitely necessary with Rachel cavorting around the barn in her womble costume, she might even have started a conga line, memory is getting hazy. 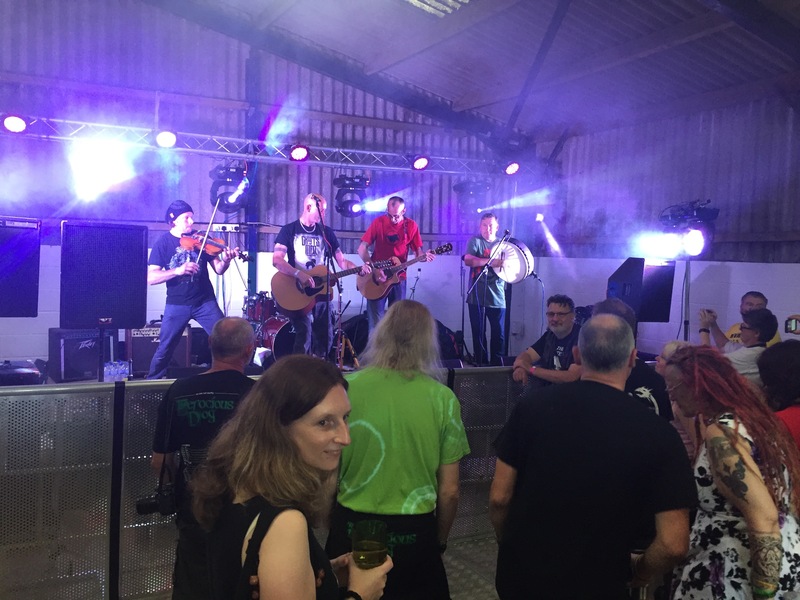 A strong finish of The Devil Went Down To Barnsley – still a fun hoe-down even without Tom to play the Devil, and the traditional finish of Jump Arahnd – we managed to surf Scott out the barn to the MeadEvil Bar where he spurned the glass of nectar proffered by Becky in favour of cider! There was time for another trip to the Mead Bar which much fun was had with decorating gingerbread men, but with laughter from the Doonicans and our confectionary creations over it was time for some rabble-rousing in the bar. Folk The System hit the stage for some bodhran fuelled folk punk goodness – foot stomping with Pil spitting out lyrics, they are looking more at home on stage each time I see them. Kicking in with Civilisation they made the most of the relatively short set times blasting through Witchfinder Generals, Environmentally Friendly, Death of a Nation, Street Corner People, Murphy’s Logic and finished up with a rousing rendition of Vanity. Honeywitch took to the stage next to unleash magical faerie infused ethereal folk on to the crowd. I’ve know Claire for a good while now in the guise of a fellow Hell Hound, it was great to see her and the band perform finally. The textures of the sound along with visuals of at one point Claire appearing to sprout butterfly wings (too slow with my camera though!) was quite enchanting – I didn’t manage to catch much by way of song titles aside from a reimagining of the very familiar Love Will Tear Us Apart. Meanwhile Ella had gotten us a pizza from the awesome Stonebaked Pizza Company who were in residence in the field, we were properly being spoiled by the food offerings on the site. 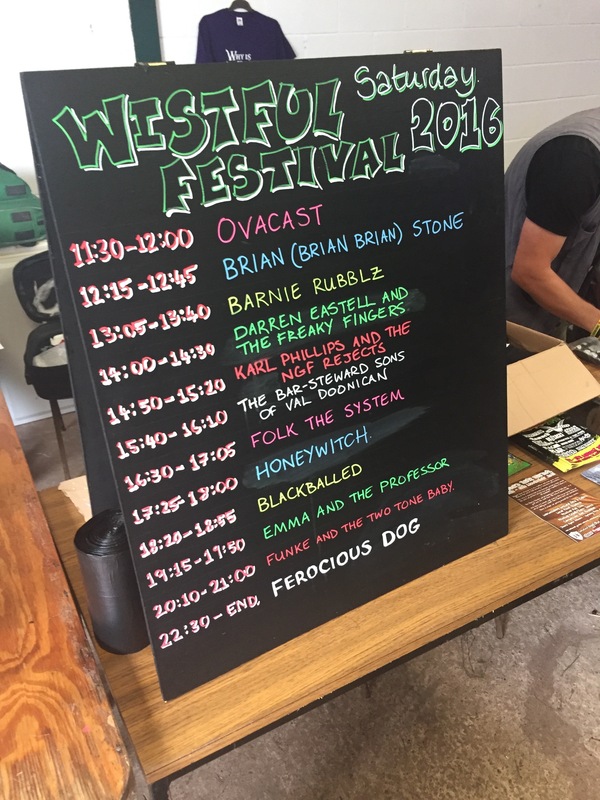 We got it munched down ready for the next act, unfortunately Blackballed had gotten a bit lost in the windy roads around the peak district – so whilst a bit of running order shuffling ensued we got treated to a bit of bonus Brian Stone. 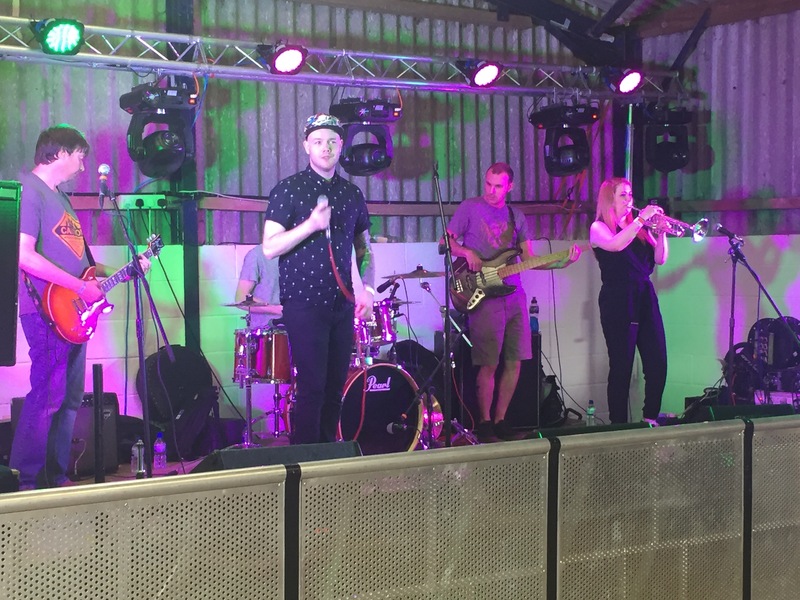 Since he was stepping in for a band fronted by Marshall Gill I snuck my bowler hat on his head – his head isn’t quite as big as mine, though (few are!) so it didn’t last long! He rattled off three songs for us – pleased at getting the chance to supplement his earlier set – treating us to Why Do You Care, the charming homage to his dad Quiet Anarchist before finishing up with a rousing rendition of Riverflow with Björn joining on fiddle to give it a bit of extra kick. Meanwhile Emma & The Professor were ready to go on a little early – in a way it worked out nicely, I think they made a nice follow-on from Honeywitch. More melodic otherworldly folk roots goodness, music that takes you on a bit of a journey. I’m not great with their song names, I do remember Battle of the Marches. It’s a shame there were no CDs on offer I’d like to get to know their songs a lot better! 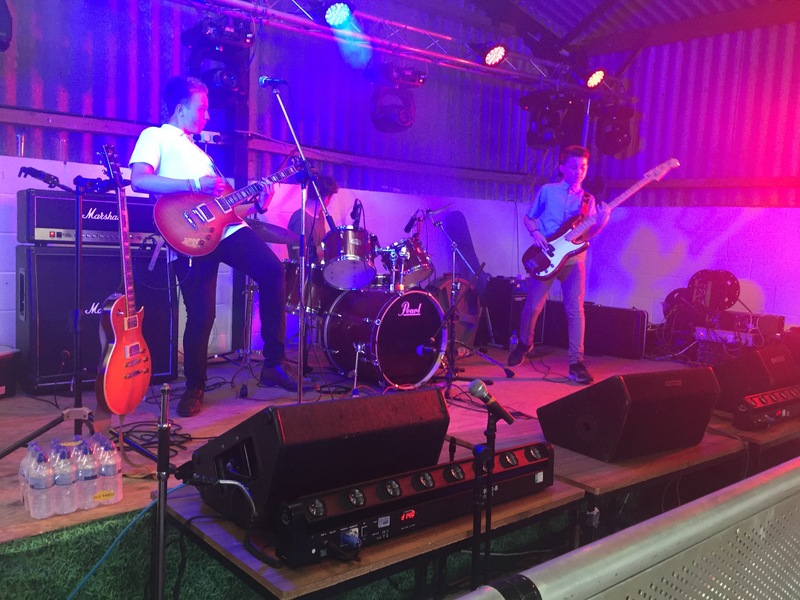 In a happy case of ‘it’ll be all right on the night’, Blackballed arrived and unleashed their awesome brand of groove rock on us. I really really really must get a CD of theirs – I bloody love watching them. In Leon they’ve got the happiest looking drummer in the world, meanwhile Marshall and Tom combine with guitar and bass to deliver one hell of an awesome sound. In fact, I’ve just nipped off to buy their EP and album since I’ve lost count of how many times I’ve wished I’d got some of their music to listen to! 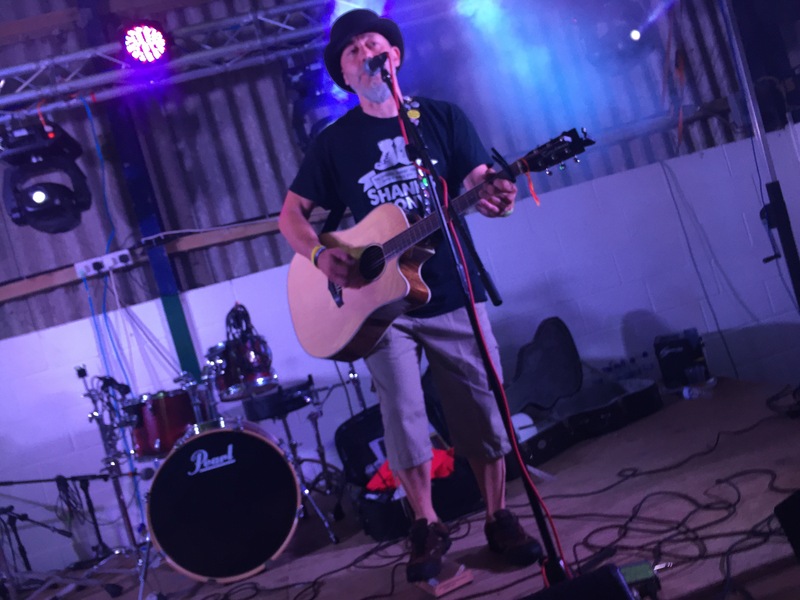 Then t’was time for Funke and the Two Tone Baby – as ever, the one-man sonic explosion didn’t disappoint. Never Used To Dance opened the set and got the crowd moving from the off through Bella’s Kiss, I’m Not Well and then the working-in-an-office ‘la la la la la-laaaaa’ song that I’ve yet to discern the title of. 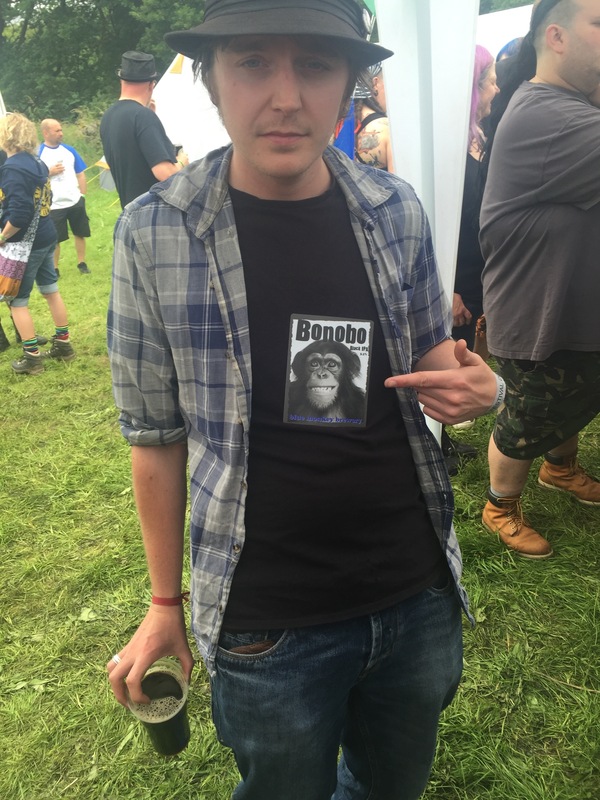 His set seemed to whizz by, flashes of Nice To Me, The Great Storm with a rousing finish of Medicine for the Soul and – of course – Not Enough Bonobo giving Andy a chance to test the stage’s bouncebackability in his gorilla costume. 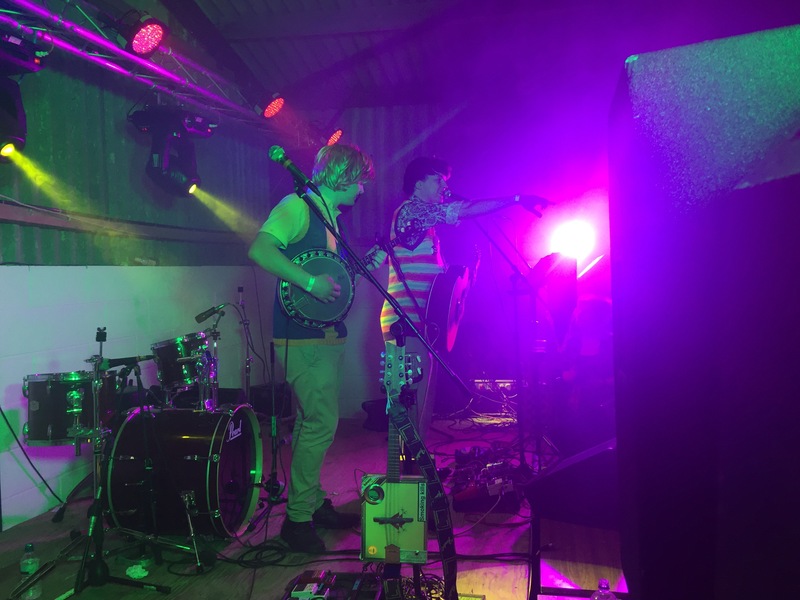 We get more Funke on Friday at Deerstock too – I can’t wait! Now having been a bit of a Ferocious Dog part-timer of late, I was looking forward to a good mosh despite the concrete floor (I only ended up on my arse once!). 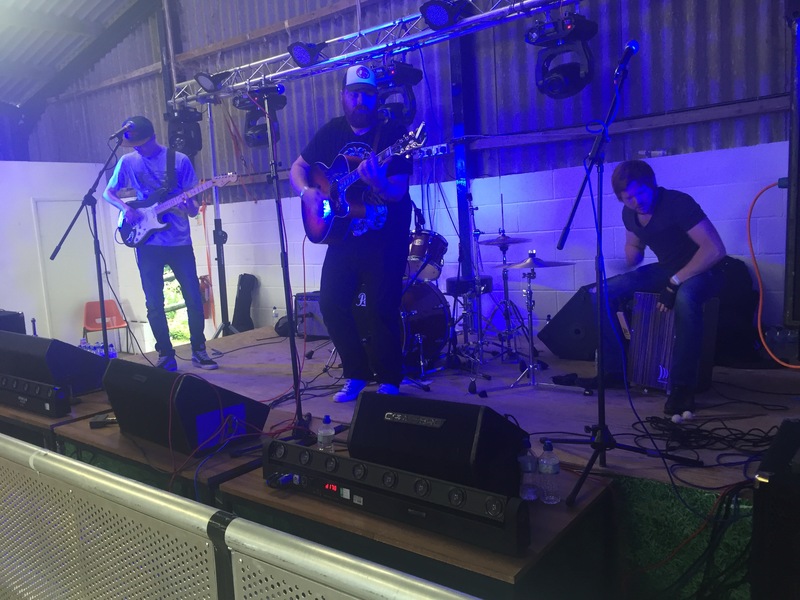 After the traditional faffing around with soundchecking they kicked in with Gallows Justice and then into Poor Angry and Young. It was good to be back amongst the thick of it, I must say – although you definitely lose moshpit fitness after a bout of absence! Verse for Lee, The Glass and Lee’s Tune completed a traditional start to a gig, Unconditional breaking the pace somewhat. Now the set list Ella grabbed a sneaky photo of has I Stand next – which I definitely didn’t hear, and I’m a bit skechy on whether Living on Thin Air made the cut either, and Crime and Punishment definitely did – then it was Too Late with a triple tower of Dean, Paul and Nicki, followed by Freeborn John, Paul being board whilst Dean surfed. Ruby Bridges and Lyla led us into some of the old faithful classics, Lisa had been hoisted onto shoulders for this at the front, I convinced her to go for a ‘fall back of faith’ onto a group of us who surfed her over and around the mosh pit and back safely over the barrier. Funny! 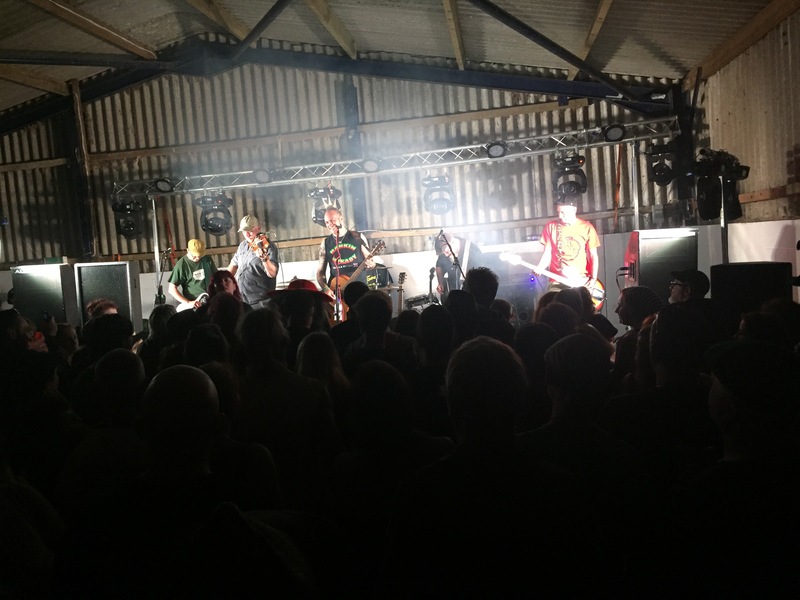 Then it was on to Quiet Paddy and Criminal Justice – Rhii was held aloft by Brian initially for Hell Hounds, then half the crowd seemed to get elevated for Slow Motion Suicide – few giving it more passion than Mick or Dave, it has to be said! We lured more unwary folk into the fray with a big circle for Freethinker before it all finished with Mairi’s Wedding Part II. Awesome to be back in amongst it with FD – it’s been too long! Outside Becky provided much needed water rather than mead – it was bloody warm in that barn! 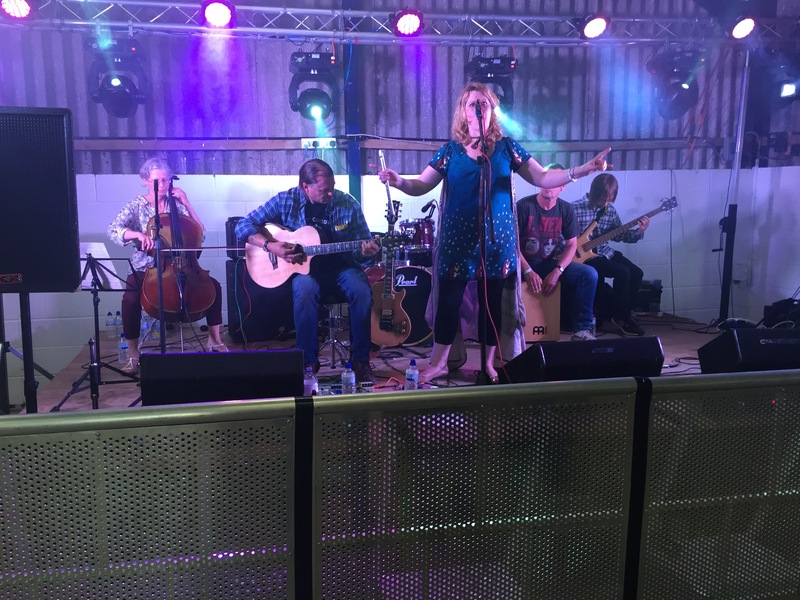 We then wandered over to the Cheezy Vinyl Bar to take in a new act called Piste Orchestra, who looked remarkably like two-thirds of The Star Copiers, at least until Kev burst in guitar in hand to join in! We just about caught Another Man’s Cause and Basketcase before the need for fresh air rendered their unamplified jollity undiscernable from outside. An amazing but exhausting day. Come morning I wasn’t feeling too bad – we leisurely packed down and said goodbyes, I was waiting for Andy to come back to site so I could take his tent to Deerstock, Ella, Becki, Emma and Simon had hit the road so I mooched around the arena carrying rubbish bags to the skip and generally appreciating the lovely weather. Ludo even got to prove his worth by towing Mark and Julie after they’d gotten stuck on the campsite. 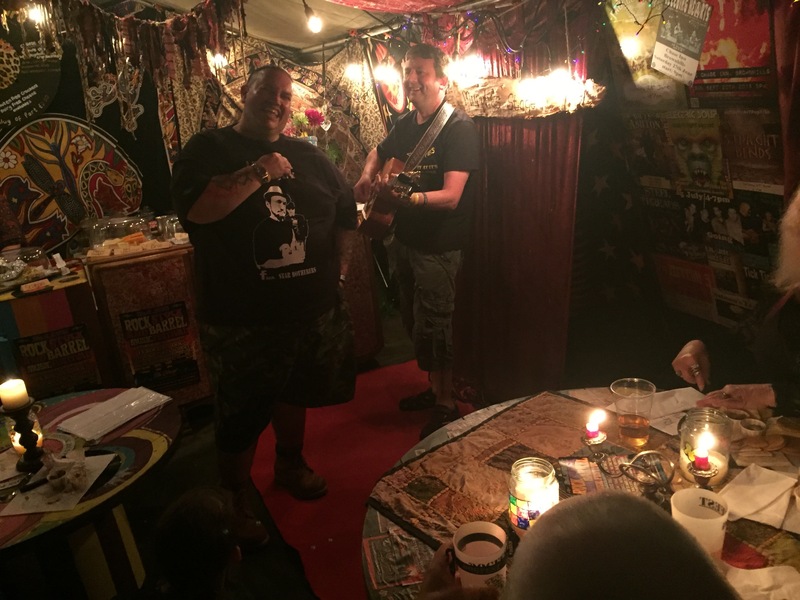 A wonderful weekend that was the doing of these two lovely folk – the setting, the acts, the food and drink, the atmosphere – sublime. 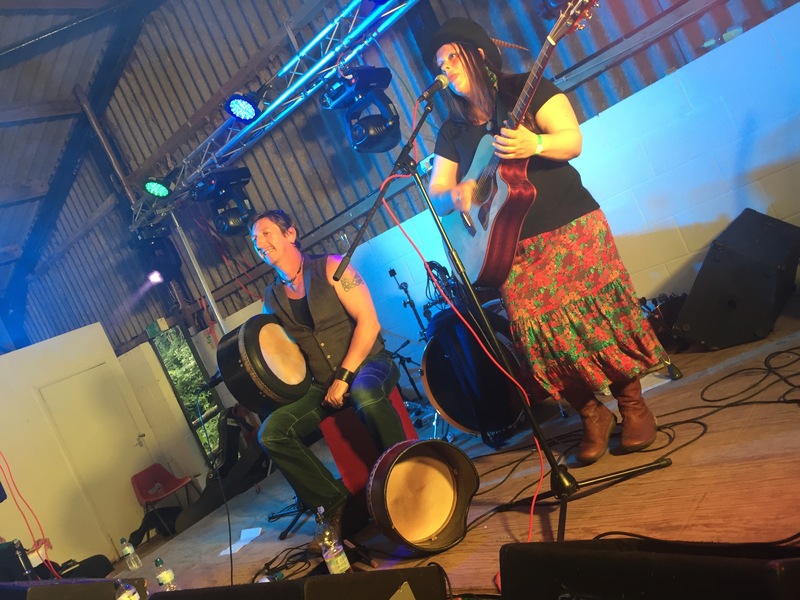 I’ve seen folk trying to league table festivals – certainly Wistful stands up alongside all the magical events I’ve been to this year, I wouldn’t say better – they all have their own unique personalities, quirks and differences – but it was undoubtedly marvellous. 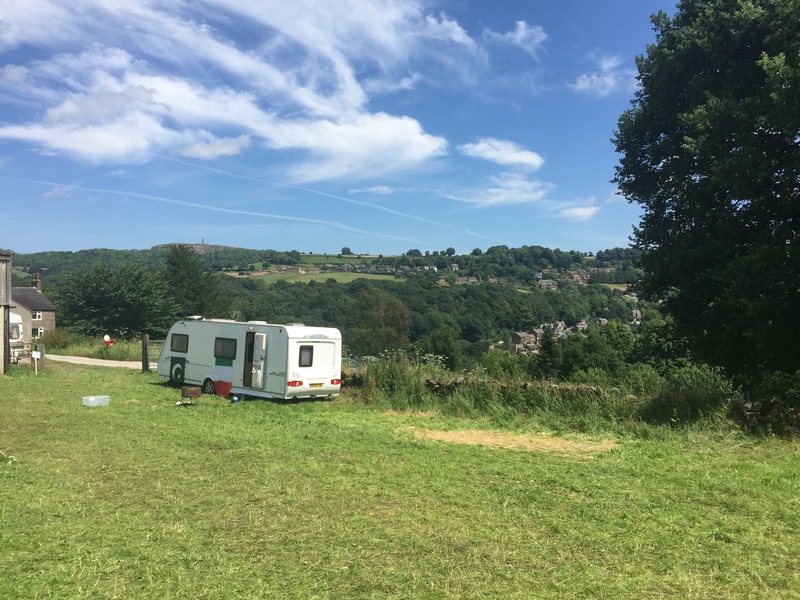 The site was immaculate too – none of your Glastonbury / Leeds / Reading / T in the Park detritus cities of abandoned tents and worse, people had really left only footprints. It was an absolute pleasure to have spent the weekend amongst such fine folk, many of whom I’ll have mentioned, many more of whom I probably haven’t – but you all know who you are I hope – and I’m looking forward to seeing many of you very soon come Deerstock in just a couple of days down now (since I’ve just tripped into Tuesday as I type! ).